The diversity of England’s Protected Wreck Sites reflects the wealth of maritime heritage preserved under the sea and around our coast. These sites provide a valuable source of evidence for a wide range of past activities, and not just of those on or in the sea. These guidelines are intended to support individuals or groups wishing to access and/or develop projects on wreck sites designated under Section 1 of the Protection of Wrecks Act 1973 in the English Territorial Sea. The role of a voluntary Licensee and his or her team is essential to the system that helps manage the most significant historic wrecks in our territorial sea. As Licensees are effectively voluntary custodians for these important sites; this has been recognised by Historic England awarding Affiliated Volunteer Status to Licensees and their teams. This guidance has been updated to reflect changes to the way the protected wreck licensing system is administered, recognise the Marine and Coastal Access Act 2009 and publication of the UK Marine Policy Statement in 2011. 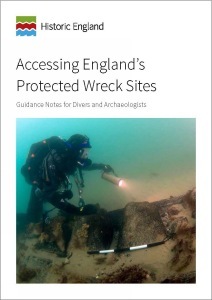 The guidance forms the approach recommended for work on all historic wreck sites in England, not just those designated under the Protection of Wrecks Act 1973.